Colourful and vibrant, Casa Popai??i? ?s new outlet in Hyderabad offers pieces with a quirky twist Ai??Ai?? CASA Pop, a Delhi-based luxury home accents and fashion accessories brand, spearheaded by Raseel Gujral and Navin Ansal, is a celebration of colours. So when they opened one of their first franchises outside Delhi, it had to be the City of Nizams. Hyderabadis love colour and that is what the brand offers. Owner of the franchise in the city, Nidhi Agarwal says, ai?? ?I spotted one of the Casa Pop flagship stores when I was in Delhi last year for a wedding. Thatai??i? ?s when I knew I wanted to open one back home.ai??? During that time, the brand had green signalled its franchise plan, hence the one in Hyderabad took shape. Agarwal describes the store as ai?? ?kitschy, pop and vibrantai??i??. It wouldnai??i? ?t be off the mark to say that the riot of emeralds, blues and tangerine is reminiscent of Delhiai??i? ?s Lajpat Nagar market. Even if you have just spruced up your living room, the high-back sofa in pink with cushions inspired from Benares will make you splurge again. The collections are inspired by various themes ai??i?? from motifs of royal heritage (Company Raj) to pomegranates (Anarkali), the ideas behind them are eclectic. Company Raj has lesser colours compared to the other collections. The imprints depict turbaned men riding elephants in the backdrops of palaces. 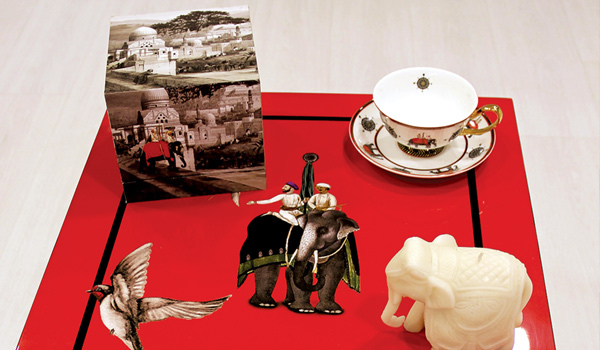 The incidental furniture, votives, tables, lanterns, and trunks with an antiquated feel sum up the collection. The ai???hurricanesai??i?? from the Anarkali range, more like artfully designed lanterns with a candle in a mix of silver and aquamarine could find favour with those who prefer subtle colours. Each collection has a distinct look and there are choices aplenty. So you can pick up whatever seems like an extension of your personality. For the men, there is a range called Gatsby. The furnishing pieces, for instance, tumblers and accessory boxes in this range comes in cobalt blue and crafted in vegan leather. They can add a dash of glamour to a bland bachelor pad. Not to adhere to pink and blue gender stereotypes, more emeralds and solid colours will be added to this collection. The pieces are designed by creative head, Raseel, who has dabbled in interior decoration for over two decades. All the elements of the collection are customised in the brandai??i? ?s factory in Delhi, apart from the crockery, which is made in Europe, after based on designs sent by the creative head. Wall art and canvas rolls are also customised as per order and the latter start from around `500 per square foot. 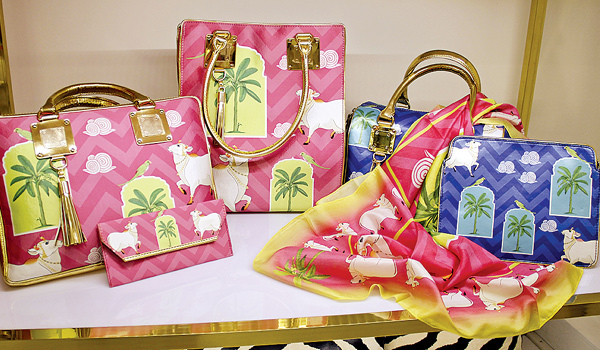 The fashion and travel accessories comprise carryalls, bags, clutches, iPad covers and so on. The pocket squares, available in an extensive range of colours, are affordable and stylish gifts, and can brighten your eveningai??i? ?s party look as well. The tangerine travel bags and laptop covers from the collection called Trellis could be statement accessories. Casa Pop dresses up according to occasionsai??i? ?preparations are on to change the colour scheme for Christmas, which will be reflected in the new collections that will arrive at the store shortly. Well, one thing is for sure, if there is a chance to celebrate hues, Casa Pop will surely cash in on it.